Source may be coming from the shifter shaft oil seal. Won’t be able to tell until you get the sludge off. Possible a PO put a longer screw in that hole and broke through the case while tightening it down. Definitely clean the area and find the source. 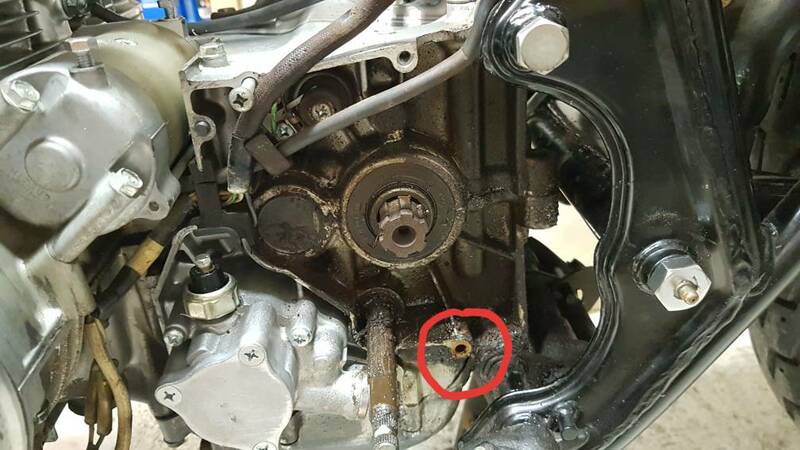 If it is what I said above you can put in an M6 1.0 set screw with some sealant on it deep in the hole and just use a slightly shorter screw to hold on the sprocket cover. Just came from garage, I cleaned area, looks it is shifter shaft seal, will check again tomorrow when I'll see oil path. In case it will be confirmed - to change that seal what need to be removed to replace it? Lube up a new one, tape over shifter splines and slide the new one into place. A well fitted pvc pipe (sanded smooth of course) will help with the final press. 76/78 XS750 triple; trash can. Checked today again, definitely leak comes from the seal. I'll order new one, thanks for advices! Bad Behavior has blocked 1251 access attempts in the last 7 days.